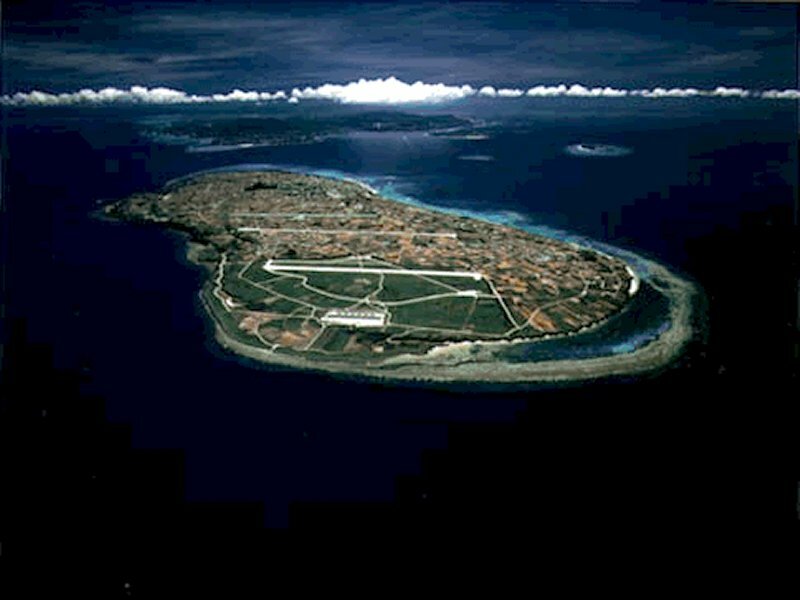 Ie Jima Auxiliary Airfield, which occupies one third of the island, is where military training exercises are conducted such as Harrier aircraft take-off and landing exercises, and parachute drop training. The island of Ie Shima, three miles west of Okinawa, was invaded on 16 April 1945, after three days of naval and aerial bombardment and beach reconnaissance by Underwater Demolition Teams. The Army's 77th Division landed on April 21. 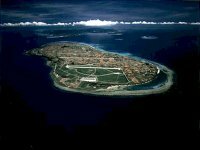 In fierce fighting over five days, this small island and airfield were won, but with the loss of 172 American servicemen killed and 902 wounded. The battles up in the northern part of the island around the airfield on Ie-jima Island were particularly fierce. In the intense fighting, many civilians as well as soldiers lost their lives. Over 100 of the civilians died in group suicides. Among the fatally wounded was well known combat correspondent Ernie Pyle, hit by machine gun fire on 18 April. He was buried on the island. Soldiers of the Liberty Division erected a crude wooden monument to the beloved Pulitzer Prize winner who was slain by a Japanese sniper. Pyle, a Scripps-Howard Newspaper Alliance reporter, was known for his simple, descriptive stories about US soldiers. His highly personal columns, like printed snapshots, erased the war's abstractions. They zoomed in on the mud, the cold, the loneliness, and the inner thoughts of America's fighting men. Other journalists wrote from a wide-angle perspective. Pyle shot close-ups. That demanded that Pyle be tough enough to endure the hardships and perils of the soldiers he wrote about. The United States and Japan released the Final Report of the Special Action Committee on Okinawa on December 2, 1996. The report made 27 recommendations to reduce the impact of the US military presence on the Okinawan people. This included the relocation of parachute drop training to Ie Jima Auxiliary Airfield. The United States transferred parachute jump training conducted by the Army's 1st Battalion, 1st Special Forces Group (Airborne), from the Yomitan auxiliary airfield (which was closed) to the auxiliary airfield on Ie Jima Island, just off the northwest coast of Okinawa. However, special forces soldiers were at increased risk of failing to maintain airborne qualifications because parachute operations training proved more difficult to complete on Ie Jima Island. About 73 percent of the training jumps scheduled between July 1996 and September 1997 on Ie Jima Island were canceled due to adverse weather at the drop zone; adverse weather at sea, preventing required safety boats from standing by in the event a parachutist landed in the water; and equipment problems that prevented the safety boats from departing their berths. These cancellations put these forces at risk of failing to stay airborne qualified. The relocation had not affected operational deployments and schedules, although training deployments had been disrupted.